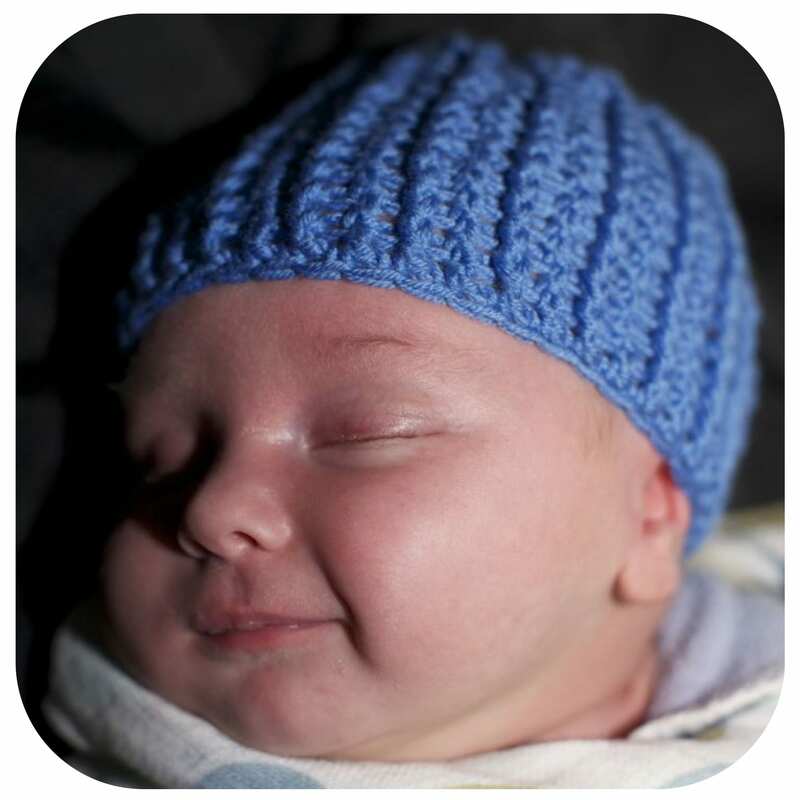 Home | Blog | Crocheted baby beanie for a bonnie little boy. A huge welcome to the world to Lorelei’s newest addition – a little boy! With 3 older sisters and a crafty mum like Lorelei, he’ll be the best mothered little man around. In this post Lorelei from www.craftsmumship.com, whips up a neat little beanie to keep a little head warm. Yesterday our baby boy gave his first smiles. I was not the lucky recipient but his Daddy was and he got no less than four in a row! I tried for the rest of the day to get my own smile but without any luck. The only smile I did manage to get was this cute little one he did in his sleep whilst I was trying to take pictures of him in a new hat that I made. I didn’t seem to have a hat that fitted him and feel bad taking him out in the cold without one so I whipped up this little crochet newborn hat with this free pattern by Barbara Summers that I found on the crocknit.com website. Using a front post double crochet stitch it gives the newborn baby hat a nice rib-like texture. My new favourite yarn at the moment is Debbie Bliss Baby Cashmerino. I love it! There are so many beautiful colours and it feels so lovely to crochet with. It’s a great little pattern which stitches up in no time which is great because with a newborn I have ‘no time’! Anyone else with a newborn out there? If not this would also make a great handmade present for someone. Well done!!! I am hopeless at crochet as despite much practise I never could get the tension even. I knitted some – a little longer than that so it protected their ears when we had to venture outdoors. No earache from the cold wind. Gorgeous bub and gorgeous beanie! oh my gosh! what a cute little boy and this is such a good photo where he is smiling in his sleep. i love how babies do that! Cute hat, but unfortunately my crafting skills are not in the crochetiing/ knitting sort of arena. Crocheting reminds me of my gorgeous nana. Love the look of the hat, and if my arthritis in my hands will let me, I’d love to try making this. But the link to the pattern doesn’t work. Can anyone help with this? How cute is this beanie? what a fantastic little cap, thank you for sharing where you got the pattern. So cute, I found the hat our youngest was given in the special care nursery and it’s so small at first I wondered why I had doll’s hat in my drawer!